Welcome to the future. Abortion is illegal, but unwinding is an accepted and encouraged practice for stressed parents. Between the ages of 13 and 18 a parent can choose to have their child unwound a process in which a youth's body, bones and organs are harvested. Technically the kid is still alive since 99.44% of them is used in surgeries and organ transplants, so why should the Unwinds mind? It's not like they are dying - just transitioning to a different type of existence. Connor is and Unwind and he minds very much. This is a fabulous, disturbing and sure to be controversial novel. Shusterman deftly handles difficult questions that have no answer: What is life? Who makes the choice? What is a soul? What make a person human? The novel is told in alternating chapters mainly from the perspectives of Connor, Risa and Lev, two Unwinds and a Tithe. (Unwinds are randomly chosen youth for the unwinding process while Tithes are raised knowing they will be unwound and taught that the process is an honor.) The characters are well-crafted, completely believable, and will have readers holding their breath, cheering and cringing in despair. This book really makes the reader ponder what they believe, what they know and what they think, all while entertaining the imagination. 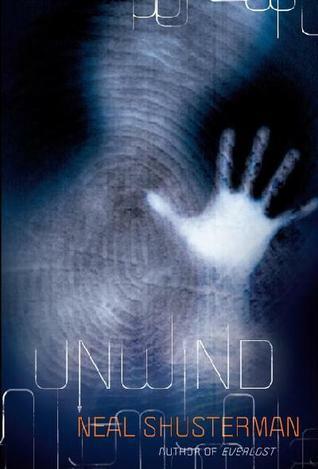 Unwind is an outstanding dystopia with both male and female appeal.